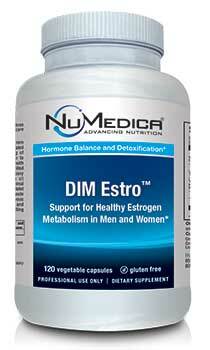 NuMedica DIM Estro supports healthy metabolism of estrogen for women and men. Although estrogen is produced naturally in the body, an excess of estrogen as well as environmental toxins that mimic estrogen is linked to health problems like an increased risk of certain cancers. Effective metabolism of estrogen, therefore, is essential for the health and well-being of your body. 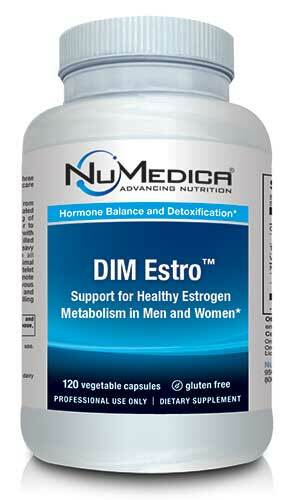 NuMedica DIM Estro boosts the body's ability to naturally eliminate excess estrogen from the body efficiently. Estrogen: What Is It Good for? Estrogen is a hormone that is essential for development and reproductive health in women. Men also produce estrogen, though at reduced levels. As men and women age, the body may produce more estrogen, which throws the hormonal balance off kilter. Maintaining a healthy estrogen level is important because there may be increased health risks associated with rising estrogen levels. In men, increased estrogen levels are associated with heart disease and prostate cancer. In women, too much estrogen is associated with increased risk for obesity and various cancers including breast and ovarian cancers. NuMedica DIM Estro naturally supports the body's ability to maintain a healthy hormonal balance by boosting estrogen metabolism. NuMedica DIM Estro contains natural extracts like curcumin and black pepper (Bioperine) that help kick start the body's metabolism of hormones. Curcumin is found in turmeric, a spice that is being touted as a super spice for its health benefits. Research suggests that curcumin may even help reduce bad cholesterol levels and help guard against stomach ulcers, colitis, and even Alzheimer's disease. Studies also demonstrate that black pepper may have the ability to block fat cell production where excess hormones like estrogen can hide. Black pepper has been used for centuries in many cultures to treat stomach ailments, reduce depression, enhance mental focus, and even ward off some cancers.